Cate Cahill and her sisters are considered eccentric bluestockings—a little odd, a little unfashionable, and far too educated for their own good. The truth is more complicated; they’re witches. And if their secret is discovered by the priests of the Brotherhood, it could mean an asylum, a prison ship—or an early grave. Before their mother died, she entrusted Cate with keeping them safe and keeping everyone, including their father, in the dark about their powers. When her father employs a governess and Cate begins to receive notes from her missing, presumed-mad godmother, her task becomes much more difficult. As Cate searches for answers in banned books and rebellious new friends, she must juggle unwanted proposals, tea parties, and an illicit attraction to the new gardener. Cate will do anything to protect her sisters, but at what cost to herself? Witches. Plain and simple I like books about witches. Banned books, searching for answers, rebellious new friends, and a class-crossing romance just makes Born Wicked sound even better! You are indestructible. Three whispered words transfer an astonishing power to Jacob Fielding that changes everything. At first, Jacob is hesitant to use the power, unsure of its implications. But there's something addictive about testing the limits of fear. Then Ophelia James, the beautiful and daring new girl in town, suggests that they use the power to do good, to save others. But with every heroic act, the power grows into the specter of a curse. How to decide who lives and who dies? In this nail-biting novel of mystery and dark intrigue, Jacob must walk the razor thin line between right and wrong, good and evil, and life and death. And time is running out. Because the Grim Reaper doesn't disappear. . . . He catches up. It sounds like a fast-paced adventure. The storyline also sounds original and I like that it's told from the perspective of a guy. These both sound great AND they both have pretty awesome covers. Great picks! Both of these sound really promising; I think I'm more interested in Thirteen Days to Midnight for the male perspective and the mystery aspect. I am SO looking forward to Born Wicked. I love me some witches. And Thirteen Days To Midnight sounds great! Do I spy the words 'Grim Reaper' in the synopsis? I like! 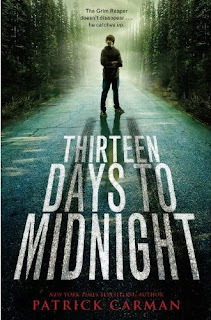 Thirteen Days to Midnight sounds interesting for the whole concept, "Who decides who lives and dies?" And the Grim Reaper makes any book better, I think. 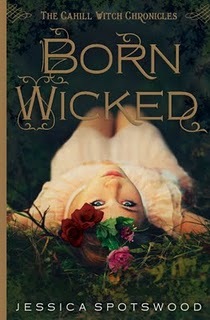 Born Wicked just looks awesome and that cover is just yummy. Oooo the second looks really good. I keep seeing the cover for Born Wicked popping up on blogs so apparently there's a lot of hype. Can't wait to read it! I haven't really heard that much about Thirteen Days to Midnight but it sounds great. SO excited for Born Wicked! That one just sounds amazing, and it's got a gorgeous cover which always makes me happy. Awesome choices! Witches! Same reason I want to read this one. And the other one I very superficially want to read because the girl's name is Ophelia. The Born Wicked cover is incredible. And the synopsis sounds great too. I'll definitely keep my eye out for it. OOO! Small these both sound great, but Witches! I love witches. I always dressed as a witch for Halloween. Still do! My children might claim that I am one already!